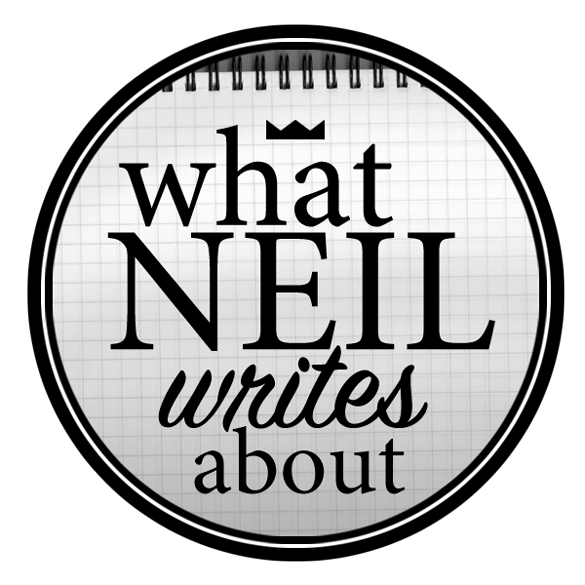 Neil Writes About Thaipan Tomas Morato! Tomas Morato has been one of the major dining locations in the Metro for several years now. As such, restaurants that have been coming and going. Very few have stood the test of time. Thaipan is one of the veterans that have been around since 2006. This must mean something, and because we have yet to eat there, we decided to see for ourselves along with some friends how it really is! They have this fancy private room that can seat at least 12 people! Thaipan at first glance is a fancy house from the 70's that was remodeled to become the premier Thai restaurant it is today. The walls are decorated with hand painted patterns from local artists. 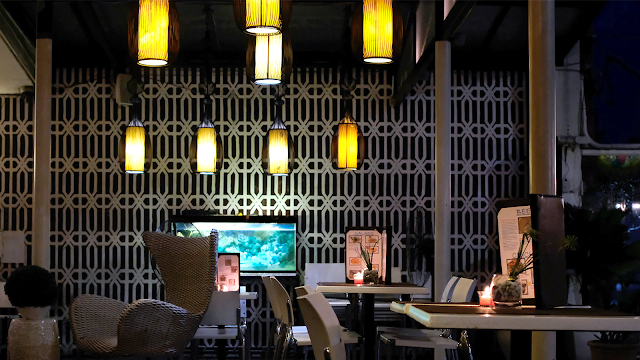 The lights are mostly yellow that give off this warm and cozy feel to it that offers a relaxing but refined mood. It may however feel dark to some people. 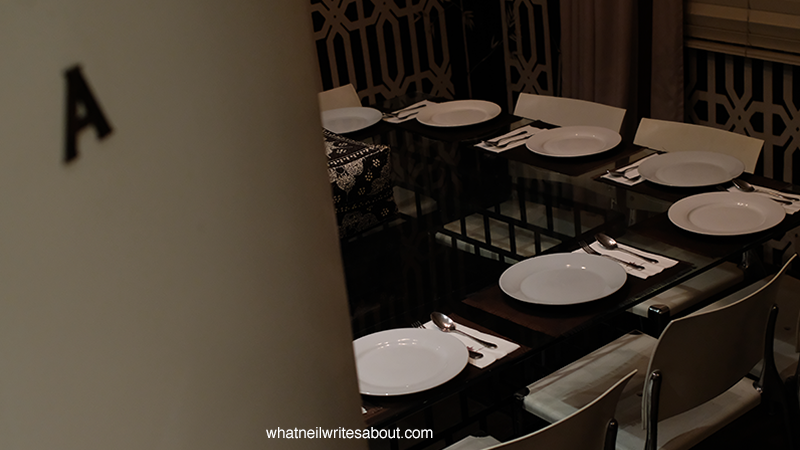 The Tables are mostly made of glass and steel while the chairs are made of premium polycarbonate and steel while utensils feel solid and have a tactile feel to them that perfectly goes along with the other steel materials in the room. A bit of a tease of what's to come! 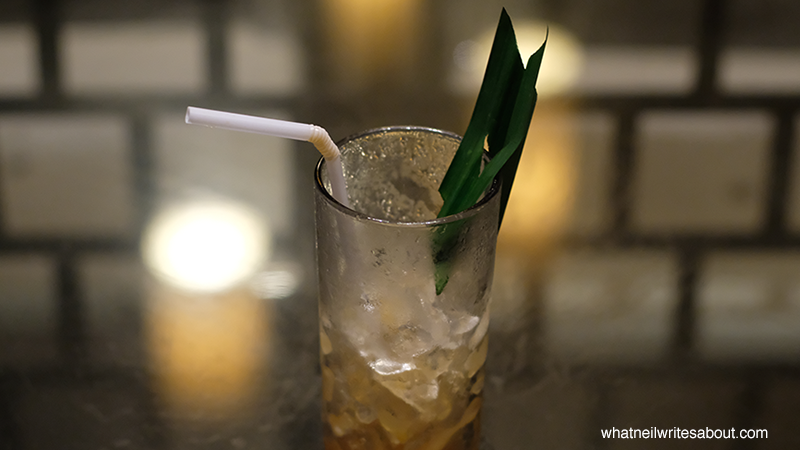 I was one of the first to arrive at Thaipan before my friends and while waiting, the waiter offered for me to check their drinks. He recommended the iced Thai milk tea which I was curious about, so I ordered one. As soon as I took my first zip, it exploded with flavor in my mouth. You could taste the milk and the tea distinctively. I was zipping so much that I forgot to take a picture hence, glass half full. 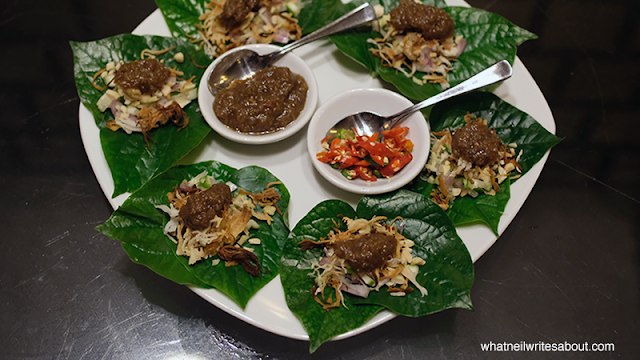 For appetizers, we were we had the Pomelo Salad and the Mieng Kham. The Pomelo Salad is different because the shredded chicken with garlic and pomelo doesn't make sense at first but when it touches your mouth it was an amazing surprise. The Pomelo's sweetness, the chicken's meatiness and the garlic's heat are all brought together by the spices which actually complements each of the other ingredients. The Mieng Kham is a standard dish and their rendition was okay. It wasn't bad but it didn't have anything special about it either. 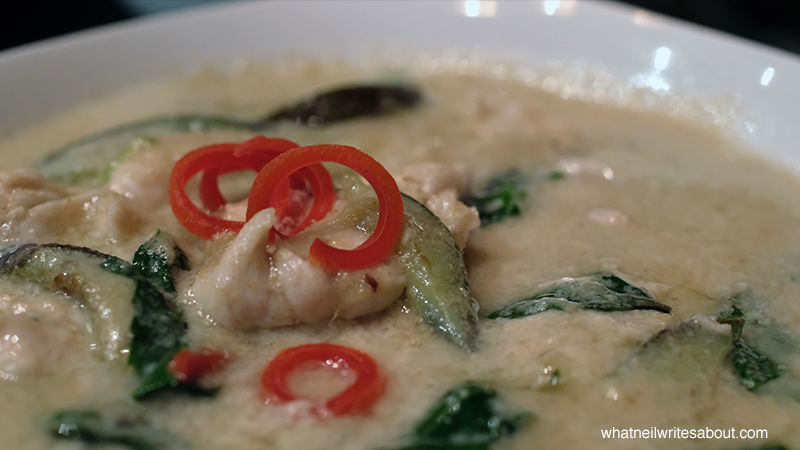 For Soup, we ordered the Tom Yum, the Laksa and the Thai Chicken Curry. We ordered the mild spicy versions of the Tom Yum and the Laksa and the they were both good. 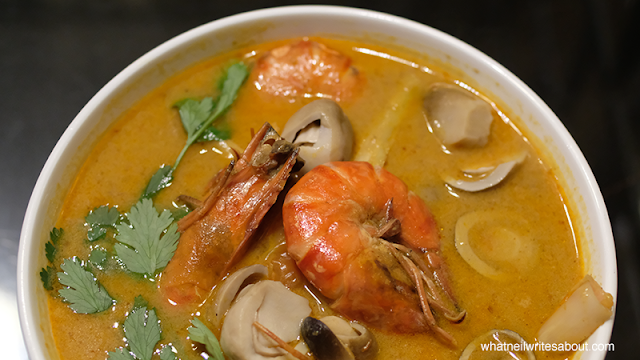 The flavors of the seafood, the vegetables and the spices of the Tom Yum hit you as soon as the soup hit your tongue. 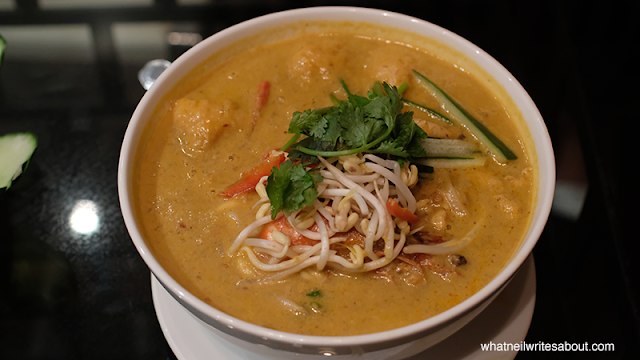 The Laksa's soup has a strong kick that is complimented by the creamy texture. I do wish that the soup was a little thicker to reach perfection. The Thai Chicken Curry was different because it's curry but it doesn't have the spicy HOT kick. Otherwise, the chicken and yellow curry sauce is good. 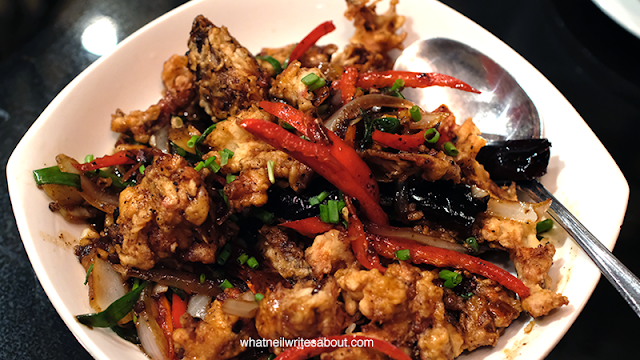 For the main course, we had quite the list: Fish Tamarind, Pandan Chicken, Stir-fried Squid and Shrimp, and Soft-Shell Crab in Black Pepper Sauce. The Fish tamarind was crunchy on the outside and soft on the inside with the moist flavor bursting fish inside. The Pandan chicken was okay. A little underwhelming compared to the rest. 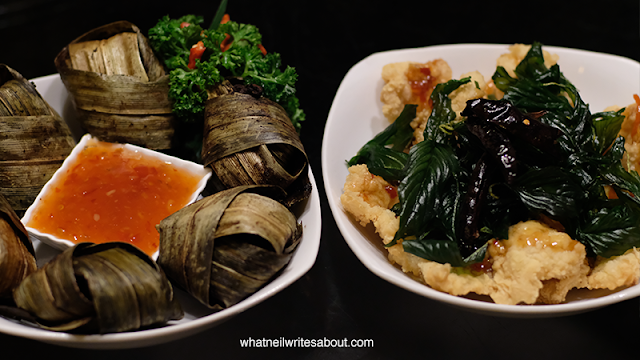 Pandan Chicken and Fish Tamarind! The Soft Shell Crab was a little salty, otherwise, the texture, the flavor and the kick worked together and is amazing. I couldn't get over at how soft and refined the texture of the crab was while the Squid and Shrimp was about the same. The technique was perfect. 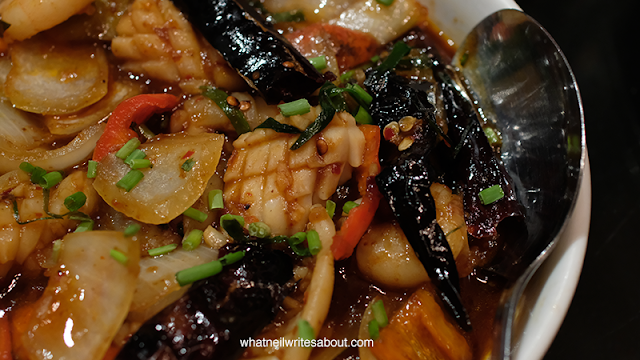 Ingredients are cooked to perfection with the flavors dancing, the textures refined and the spiciness just right! 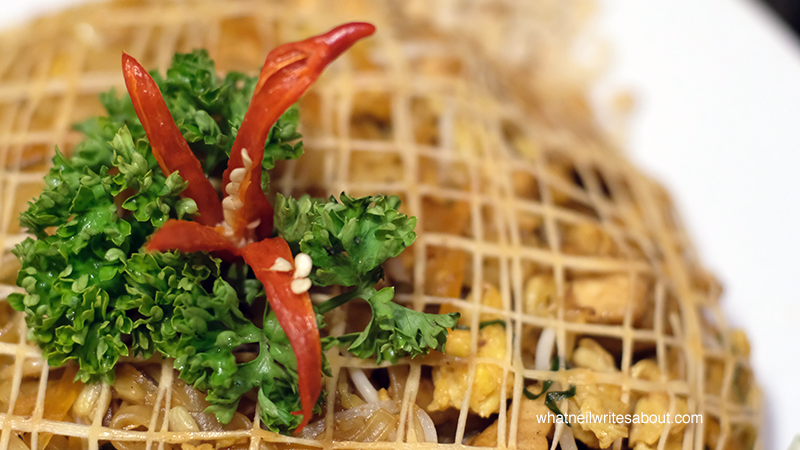 Last, but not the least: the Phad Thai Noodles! The preparation was unique as the tofu and the rest of the ingredients are inside. The sauce was amazingly flavorful which mildly thick texture that brings out the individual flavors of the other ingredients. It is best to eat this right away because the flavor changes as the ingredients soak up the sauce making the texture soggy. 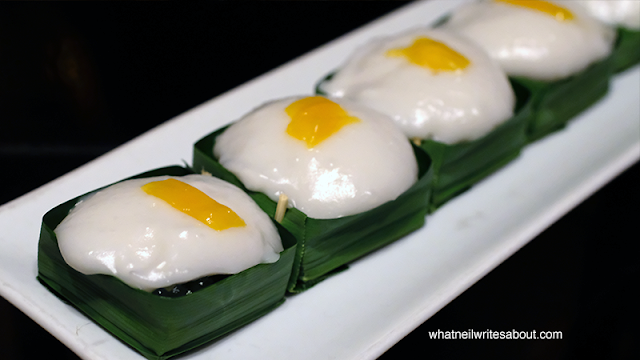 For dessert we had the Ta Koh Sakhoo which is a tapioca pearl topped with creamy steamed cake. It was absolutely, decadent. The way the steamed cake oozes and melts in your mouth while the mild sweetness hits you is absolutely, heavenly. I recommend this dessert! It's refreshing coming from seeing mostly chocolates and ice creams as dessert options. The service was good. I was entertained as soon as I arrived, even though my companions arrived a little later. They were kind enough to set the table and offer me a drink first. We waited for ten minutes and the first few dishes arrived, and we were soon overwhelmed because most of the dishes came together. This is not a bad thing as we were given the chance to taste everything. The price of the dishes vary. The appetizers start at Php 198 and averages around Php 250. 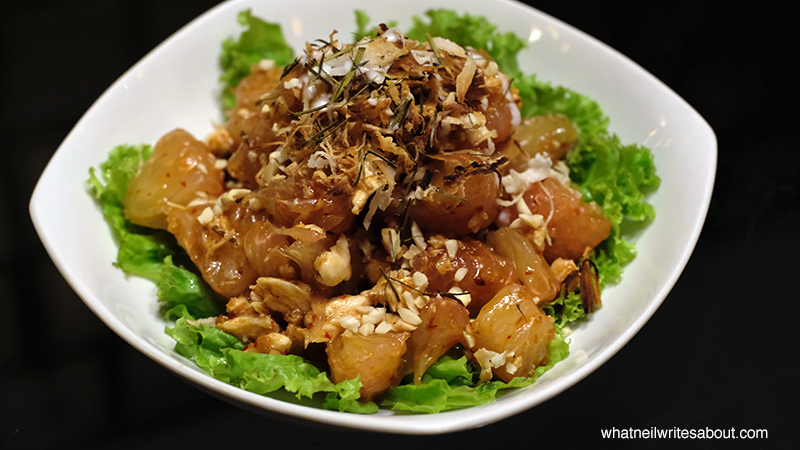 Salads and main dishes start at Php 250 and can get up to Php 399 while the drinks start at Php onwards. The decadent desserts start at Php 178 to Php 205. I find their pricing justifiable relative to its quality and its portions. 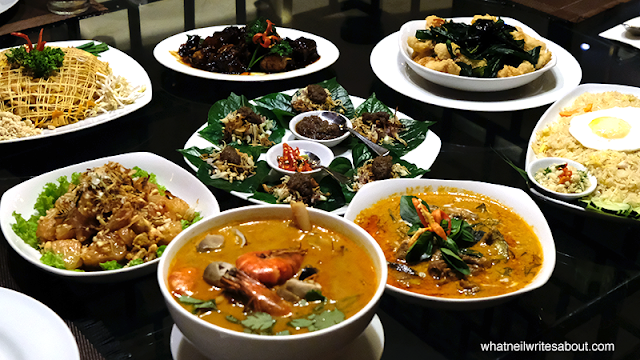 With each dish that I have tasted, I never found any to be over priced and I enjoyed my stay with Thaipan. That Dessert was heavenly and refreshing!